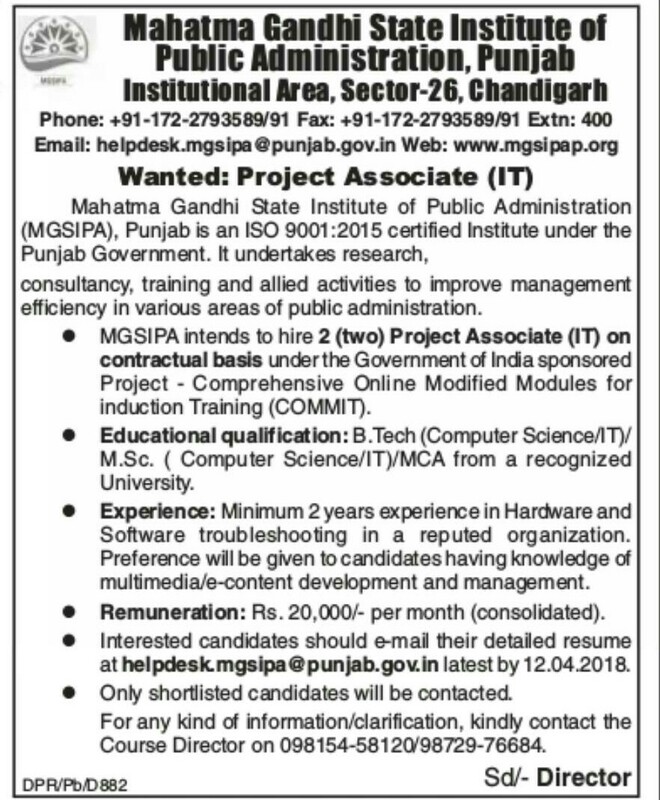 Punjab Mahatma Gandhi State Institute of Public Administration, Chandigarh invites applications for the post of Project Associates on contractual basis under the Indian Govt sponsored project COMMIT. All eligible candidates should have to apply before Last date – 12 Apr 2018. Check the eligibility criteria, selection procedure, job description & other details of given below. Educational Qualification : B.Tech/M.Sc (Computer Science/ IT) or MCA from any recognized Uni/Inst. Please ensure that Degree result should be declared as before apply. Experience : Must have 2 years relevant experience in software & hardware troubleshooting, e-content/Multimedia development. Eligible candidates send their detailed resume on email helpdesk.mgsipa@punjab.gov.in before last date 12.04.2018. Only shortlisted candidates will be contacted. Ensure your eligibility before apply.